Before the Civil War most of the powder facilities were located in the South, and hence confiscated by the Confederate Army at the beginning of the war. At the conclusion of the war, the U.S. Army searched for a more centralized location and settled on Morris County, NJ. 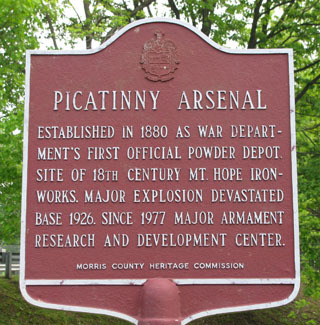 In 1907 a manufacturing plant was constructed to produce gunpowder and heavy munitions. Around 1911, a school was started that instructed officers in weaponry sciences. 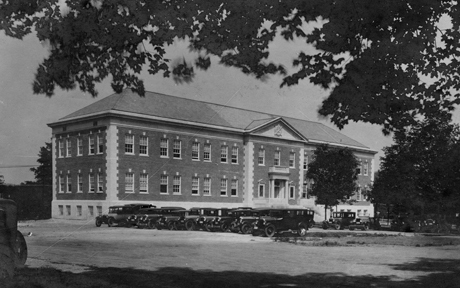 Testing laboratories were added during WWI and by 1919 a small facility was constructed for research and development. By 1921, the arsenal was experimenting on fuzes. With the advent of WWII, research was set aside when the facility was converted to a large-caliber-round loading plant. At its height, the location ran three shifts and employed over 18,000 people. Today, covering ten square miles, the arsenal develops new technologies for all the U.S. Armed Forces and builds various munition, weapons and armor systems. According to the Arsenal’s website there are 1,000 permanent structures including sixty-four laboratories. More than 5,000 civilians, 1,000 contractors and 160 military personnel are employed there. 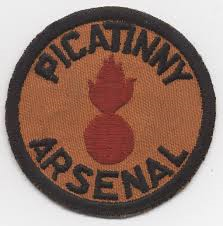 Check out the arsenal’s Facebook page https://www.facebook.com/PicatinnyArsenal/ for more information.